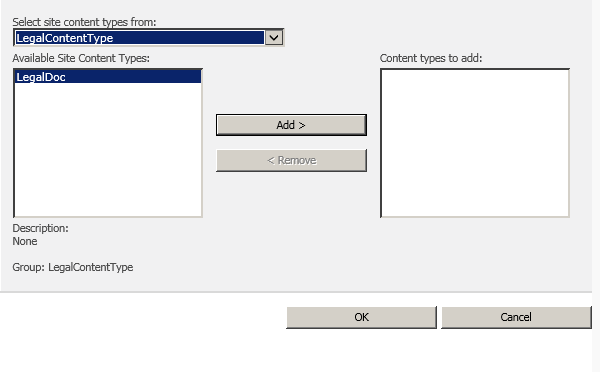 What is Content Type Hub in SharePoint 2010? Content type hub is a new feature which comes with Managed Meta Data Service in SharePoint 2010. I have worked with SharePoint 2007 and I know that there is a problem for creating an enterprise library and sharing them across the site collections. There was no out-of-box solution to share content type which is created under a single site collection. New Managed Meta Data Service in SharePoint 2010 has overcome this problem. Using this new feature a content type which is created under a single site collection can be shared across multiple site collections. How to create Content Type Hub in SharePoint 2010? 1. So let's start content type hub by creating a site collection. 4. Now select Managed Metadata Service Connection and click on properties, and make sure first 2 options are unchecked and last 2 should be checked, as per below screen. 5. Create a new Content Type with name "Legal Doc". Go To setting of Site Content Type as shown in below screen. 6. Click on "Manage publishing for this content type"
7. Select Publish and click on ok.
8. Now create a document library in any site collection and got to settings. 9. Click on Advanced settings under General settings, and select Yes for "Allow management of content types?" 10. Now again go to the settings page of the document library. 11. Click on Add from existing site content types. As shown in below screen. 12. Select the newly created content type from the drop-down and add. 13. Now, this is important. There are 2 timer jobs which are associated with Content Type Hub. Please go to central Admin->Monitoring->Timer Jobs->Review job definitions and then run 2 jobs mentioned below. So content type hub allows us to share the content type across the site collection. This is a powerful feature comes with Managed MetaData Service in SharePoint 2010. Hope you would like this article. If yes then please like on Facebook and leave a comment which will boost me to write more articles.